Nationally known hip hop artist Brother Ali and Syrian-American artist Omar Offendum will explore the relationship between hip hop and peace at 8 p.m., March 9, at the 25th Annual Nobel Peace Prize Forum in Minneapolis. The artists will speak about their music, their roles as activists and humanitarians, the social and moral dimensions of their music as a force to unite communities, and whether artists have a special moral responsibility. Each presentation, at Augsburg College's Kennedy Center, will feature a short music set, followed by a talk that includes audience question and answer. "Brother Ali and Omar Offendum will show us how music can play an inspiring and everyday role in our work to create a more just society," said Maureen Reed, executive director of the Nobel Peace Prize Forum. "We are honored to have these inspirational, young leaders join us, and to build upon the message and topics explored last year by Doomtree's Dessa." "Music can be a message from the heart of humanity," said Robert Stacke, Augsburg College associate professor of music in a 2012 interview about the impact of music on the Arab Spring. "Music can motivate a population in a manner that words alone cannot do. It is a powerful tool that can inspire political action and send its message to the world." In March 2012, renowned rapper, singer, and writer Dessa spoke at the Forum. She discussed social and moral dimensions of hip hop as a force for peace with the power to unite communities in her presentation "Mic Lines: Art, Ethics, and their Contested Connections." Nearly 800 people attended the event. The Nobel Peace Prize Forum, March 8-10 in Minneapolis, is a premier international event designed to inspire peacemaking. Now in its 25th year, the Forum celebrates the work of Peace Prize Laureates, and deeply explores questions of peace and conflict. This year's program addresses issues in business, health and science, and global issues. Keynote speakers include Peace Prize winners Tawakkol Karman and Muhammad Yunus. Learn more about Karman, Yunus, and how the Forum brings the world to Minneapolis in a January 21 article. The program is housed and coordinated by Augsburg College in partnership with the University of Minnesota's Humphrey School of Public Affairs, and five other Norwegian Lutheran colleges. The Forum's corporate sponsors include Land O'Lakes. Details and tickets at nobelpeaceprizeforum.org. All college/university students, faculty, staff, and members of the community must register to attend the Forum; register for one day or multiple days. Augsburg students, faculty, and staff can attend for a discounted price. Student tickets are $10. Augsburg faculty and staff tickets are half price when purchased using the promo code listed in the January 15 edition of the Daily A-mail. 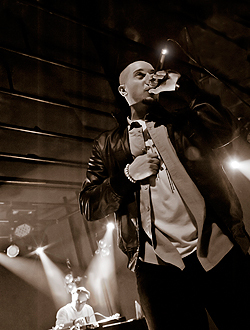 Brother Ali is a hip hop artist, speaker and activist from Minneapolis with six critically acclaimed albums and mentorships with hip hop legends Chuck D and Rakim to his name. He's performed on late night talk shows with Conan O'Brien, Jimmy Fallon, and Craig Ferguson. Ali's latest album, "Mourning in America and Dreaming in Color," was issued in 2012 and is his commentary on the political, socioeconomic, and cultural suffering in modern American Life. It also is a declaration of hope and possibility for a brighter future. Omar Offendum is a Syrian-American hip hop artist, educator, speaker, and activist, who was born in Saudi Arabia, raised in Washington, D.C., and lives in Los Angeles. He has been featured in media including Rolling Stone, PBS, Al Jazeera, Los Angeles Times, and The New York Times. He is an activist who helped raise hundreds of thousands of dollars for humanitarian relief, and who writes and sings about democratic uprisings in the Middle East and North Africa.